If you're younger than 18 years old in Vermont, you will be required to enroll in a driver's education class in order to get your driver's license. There are no exceptions to this rule. To get a jump-start on the class, do yourself a favor and get your hands on a Vermont Driver's Manual. Not only will it explain the licensing process in detail, but it will also educate you on the rules of the road. Your driver's education course is designed to provide you with safe driving knowledge and supervised behind-the-wheel practice that should help you to pass your driving test and get on the road with your full driver's license. 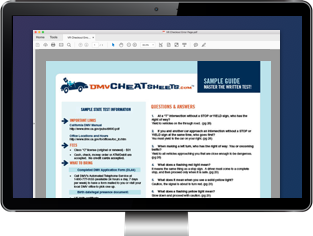 On this page you'll find a general overview of your driver's education requirements, course completion options, and the next steps you need to take to obtain your first driver's license. You'll be able to begin your graduated driver licensing steps when you are at least 15 years old by passing the DMV written permit test and enrolling in Driver's Ed and applying for your learner's permit. For more information about obtaining your learner's permit, please visit our Driver's Permits in Vermont page. All Vermont driving schools and driving instructors are licensed by the Vermont Department of Motor Vehicles (DMV). NOTE: At this time, the Vermont DMV does not approve driver's education online. Even if you earn a certificate that way, it will not be recognized by the state. Having said that, some online driver's training courses can be excellent supplementary tools to help parents learn how to teach their young drivers (and for teens to get an extra boost of practice) during the time a learner's permit is held. You are free to enroll in any of the state-approved driver's education programs. Visit the Vermont DMV website for a complete list of driver training schools. Many, conveniently, also provide state-endorsed driver license testing. Driving courses are administered by private companies who are licensed by the state. At least 30 hours of classroom time. 6 hours of behind-the-wheel driver's training. 6 hours of riding as a passenger and observing. Vermont traffic laws and violations. The Vermont DMV licensing procedures. Sharing the road with other drivers, motorcyclists, and pedestrians. Defensive driving attitudes and behaviors. The skills and knowledge you gain during the classroom and in-car components of your driver's education course are both designed to help you pass your driving test and begin driving by yourself with your first driver's license. Upon passing the course, you will receive an official Driver's Ed Certificate. This will serve as your validated proof of completion when you apply for your first driver's license. For more information about the documents, forms, fees, and other requirements you'll need to present to the DMV for your driver's license, please visit our Applying for a New License (Teen Drivers) in Vermont page.